One of the main reasons that I am so passionate about Girl Scouting is because it exposes girls to new ideas, encourages them to take risks, actively problem-solve and use their imaginations and creative skills. We want each of our girls to be confident and courageous and pursue their dreams. This also includes their career dreams – work that they would find fulfilling and meaningful. 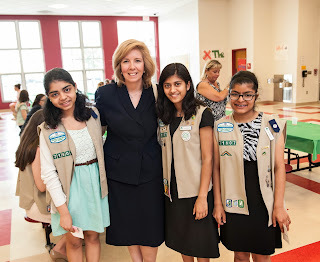 Many of the girls I have met in our Council are focusing on careers in science, technology, engineering or math (STEM) ~ not so surprising really, as through the Girl Scout experience girls have an opportunity to be exposed to these areas both formally, and informally. My granddaughter Emma is in the third grade, and she loves math. I remember that at that age, I loved math too. I also remember switching from the more challenging math courses in high school to a lower level because there were few girls in the class, and I didn't want the boys to think I was smarter than they were. My thinking seems silly now, however we know that girls today have similar concerns. Women are still woefully under-represented in STEM fields – both at the professional senior level, and at all levels in the academic pipeline. Study after study shows that girls lose interest in math and science in middle school and shy away from any academic work that would make them seem “different” from their peers. The lack of accomplished women as role models only compounds the challenge and further divides girls from the success of boys in these fields. “Generation STEM”, a research report from the Girl Scout Research Institute published last year, uncovered two important points as we look at this issue and discuss what we need to do to change the statistics. Although the stereotype that girls shy away from math and science because they are “boy things” persists, 74% of teenage girls report interest in STEM academic subjects and career fields. In other words, just as many girls as boys do have interest in STEM careers. This statistic might surprise you, because what most of us see – the numbers of girls who actually enroll in college programs in STEM fields, which is much lower. While nearly ¾ of girls have interest, only 13% take action and pursue STEM careers. Why does it matter? First, it’s all about the numbers when we look at the sheer fact that growth in STEM occupations has outpaced that of other occupations at a rate of 3 to 1. The specialized expertise required for STEM careers is at a premium in our country, and as a result, analysts project that we will not have enough qualified job candidates in the US to meet future employment demand. Girls must be poised to take advantage of these jobs, with equal economic opportunity to be successful doctors, scientists and engineers. Researchers and experts in STEM education also agree that boosting the number of women in STEM fields could potentially help us solve problems that have been overlooked in the past. There could be a girl out there who will find a cure for Alzheimer’s; invent the next I-Pod; or design the next alternative energy source. We are underutilizing human capital. And second, I don’t need to tell you that STEM offers some of the best paid occupations in our economy, and that our girls deserve to be paid well so that they can build independent, financially-stable futures. Whether a troop leader, staff member or other volunteer – all the adults in our council can make a difference. Let’s continue to encourage our girls to be smart, bold and empowered to pursue the academic courses that interest them. Let’s ensure that they feel confident about their skills in math, science and technology – and don’t dismiss them because others might question them. Let’s all lend our voices with Girl Scouts of the USA to ensure that girls have what they need in order to succeed in STEM careers. We can support the girls in our lives to stick with math and science if they love it – and pursue the jobs of the future. Find STEM programs on our online calendar.